Thermodynamics is the science of energy. It is most often used to analyze machinery which uses heat energy to run, such as steam turbines and internal combustion engines. Such machines are called heat engines. Thermodynamics is often used in combination with heat transfer analysis. I will focus the discussion here on heat engines since they are a central subject in the application of thermodynamics. The key principle behind how heat engines operate is that heat is applied to a working medium, such as air, which increases its pressure. This high pressure medium then "pushes" against an object causing it to move. This object could be a piston or a turbine blade. The motion of the piston (or turbine blade) is then converted, through a series of mechanisms (such as a crankshaft and transmission), into useful work. This useful work could be the forward movement of an automobile, or the production of electricity using a generator. Thermodynamics is the analytical means by which to design a machine which can most efficiently convert heat energy into useful work. To illustrate the basics of this concept, consider the schematic below of a piston for a two-cycle engine. There are two stages for the piston motion; outward motion (shown on the left) and inward motion (shown on the right). For the first half of the engine cycle the piston moves outward, and for the second half of the engine cycle the piston moves inward. The green line shows the top-most position of the piston and the red line shows the bottom-most position of the piston. 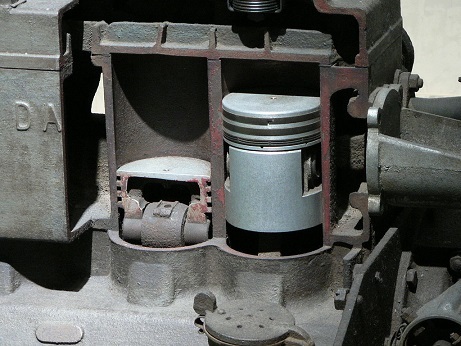 The piston moves continuously between these two positions, and turns a crankshaft (not shown) connected to it. Inside the piston chamber there is a working medium, which is air. For the first half of the engine cycle (shown on the left) the air, which is mixed with fuel, is ignited with a spark plug (not shown). This causes the air temperature inside the chamber to increase to a high level, which might be as high as 2500 degrees Celsius. The high temperature causes the pressure of the air to increase to a high level. This high pressure air pushes on the piston causing it to move outward and do work. Near the end of this cycle an exhaust valve opens (not shown). This allows the air inside the chamber to be released, which lowers the pressure inside the chamber. At the same time fresh air is sucked into the chamber through another valve (not shown). For the second half of the engine cycle (shown on the right) the piston moves inward. The inward motion of the piston requires energy since it must push against the air inside the chamber. 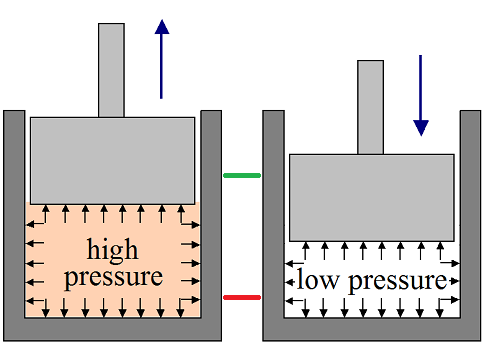 However, since the air pressure in the chamber is lower than in the first stage, the energy needed to push against the air is less than the energy that was applied to the piston when it was pushed outward (in the first stage). As a result, net work is produced, and this net work is used to run the engine. At the end of the second stage, with the piston at the bottom-most position, a full engine cycle has been completed. And now the air inside the piston chamber will once more be injected with fuel and then ignited with the spark plug. The process will then repeat. The back-and-forth motion of a piston is usually very fast. For example, an automobile engine will usually run at thousands of revolutions per minute, using multiple pistons. All real-world heat engines use a gas as the working medium since it is most efficient. A working medium must be able to expand easily when heat is applied, and this is why a gas is most suitable. Using a liquid wouldn't work nearly as well, and neither would a solid. The medium used is usually air, but it can also be other types of gas, such as hydrogen or helium which is used in Stirling engines. Thermodynamics is an interesting subject with a lot of applications. I've described one such application, but there are many more. Here are some fun toys that demonstrate some of the principles of thermodynamics: drinking bird and hand boiler.